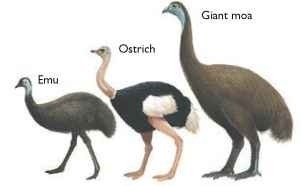 These were BIG birds and we hunted them to extinction. >>> Wiki>>> The Māori arrived sometime before CE 1300, and all moa genera were soon driven to extinction by hunting and, to a lesser extent, by habitat reduction due to forest clearance. 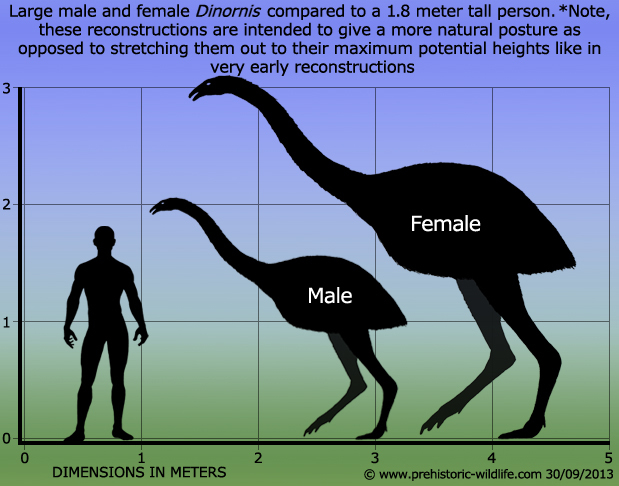 By 1445, all moa had become extinct, along with the Haast’s eagle which had relied on them for food. Recent research using carbon-14 dating of middens strongly suggests that the events leading to extinction took less than a hundred years, rather than a period of exploitation lasting several hundred years, which is what had previously been hypothesized. Some authors have speculated that a few Megalapteryx didinus may have persisted in remote corners of New Zealand until the 18th and even 19th centuries, but this view is not widely accepted.Some Māori hunters claimed to be in pursuit of the moa as late as the 1770s. Whalers and sealers recalled seeing monstrous birds along the coast of the South Island, and in the 1820s, a man named George Pauley made an unverified claim of seeing a moa in the Otago Region of New Zealand. Now imagine the Moa running after you like this! Why do I post this in a Young Earth thread? Because it goes to show you that “ancient/old” creatures were not that far away and its not that hard to imagine yourself living (running) with/from a monster!